More than a few major tech companies have been eyeing BlackBerry maker Research In Motion (RIMM), according to recent published reports. Reuters is reporting that Amazon.com (AMZN) hired an investment banker this summer to explore a potential buyout of RIM. Sources are also telling The Wall Street Journal that Microsoft (MSFT) and Nokia (NOK) have had informal takeover talks with the smartphone pioneer. Amazon? Microsoft? Nokia? These are some pretty heavy gentleman callers pining away on RIM's front porch. It's certainly not unusual for companies to talk to one another. It also bears emphasizing that "unnamed sources" aren't always accurate, especially if they have ulterior motives. These reports are obviously more credible than the wishful thinking that often turns into rumor mill chatter, but we can't jump to any conclusions here. This doesn't mean that this isn't happening. All of the attention does make sense. RIM's stock has shed nearly 80% of its value this year, even though its subscriber base is technically still growing. Why wouldn't an opportunistic buyer come in and buy RIM at a fire-sale price? BlackBerry's future prospects may be dim, but Amazon, Microsoft, and Nokia are cocky enough to believe that they could be the ones to turn its fortunes around before it's too late. There are a few things working against a potential pairing. For starters, none of these exploratory talks have resulted in public acquisition offers. Did potential buyers kick the tires and not like what they found? Is RIM asking for too much? We don't know. The Reuters report claimed that Amazon eventually gave up the fight, though the Journal's piece is unsure where things stand with Microsoft and Nokia. It is clear that all three of the rumored interested parties do want enhanced exposure in mobile. Amazon's success with the Kindle Fire this year finds many analysts speculating that the online retail giant will bring out its own mobile phone next year. 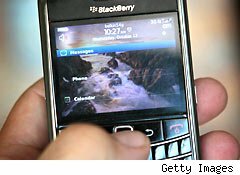 Microsoft is paying Nokia billions to champion its new mobile operating system, so RIM and its 75 million BlackBerry users would look good on the arm of either company. The mobile platform war is dividing into two camps -- Apple's (AAPL) iOS and Google's (GOOG) Android -- and everyone else is left fighting for scraps. Acquiring RIM doesn't guarantee success, but it may be the best chance for a tech giant to try to gain some kind of influence on existing smartphone owners. The chatter will continue, especially the cheaper that RIM gets. However, as long as buyers are too uncertain and the seller is too proud, don't count on a deal happening right away. Longtime Motley Fool contributor Rick Munarriz does not own shares in any stocks in this article. The Motley Fool owns shares of Google, Apple, and Microsoft. Motley Fool newsletter services have recommended buying shares of Apple, Amazon.com, Microsoft, and Google. Motley Fool newsletter services have recommended creating bull call spread positions in Apple and Microsoft.